28 December: St Francis Field will be holding their annual fly-in and open day on Sunday 28th December. 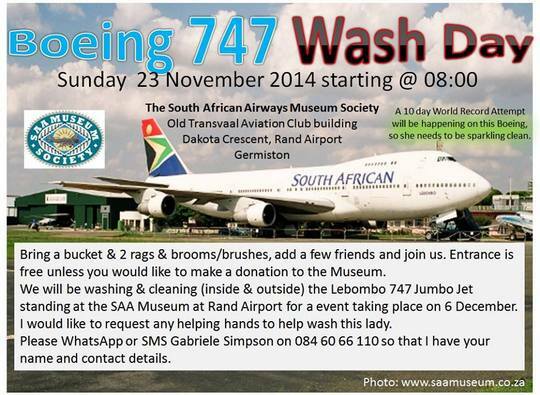 The event will start at approx 07h30 and run till around midday. There will be a wide variety of aircraft and helicopters flying in and on display, and if the weather permits, skydivers will drop in and visitors can go for a tandem skydive. Food and soft drinks will be available. Bring the family and friends for a fun morning. 15 to 18 April: AERO Friedrichshafen dedicates itself in offering a significant collection of aviation related products and accessories. Exhibitors will be showing engines, modern ultra-lights, powered aircraft, avionics and related products and services. Over the years, this show has gained huge reputation from all over the world and the positive reaction from the attendees has motivated the exhibitors to improve the existing range and manufacture more such effective spare parts and products. 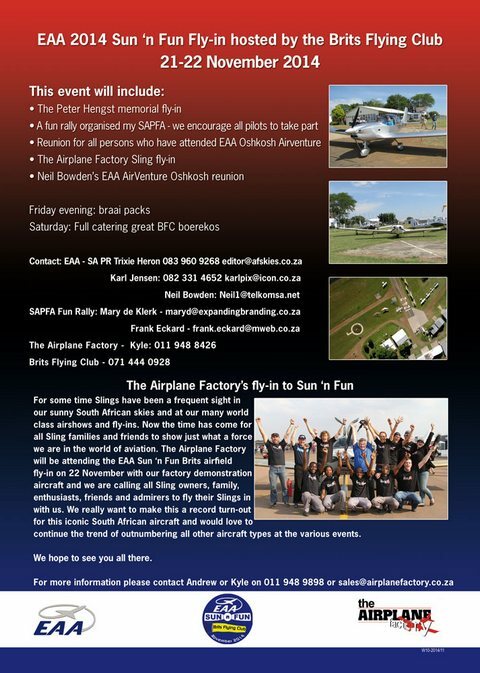 For further information on the tour African Pilot is planning please send an e-mail to Athol Franz: editor@africanpilot.co.za. The idea is to get a package deal together for about 10 to 12 persons wishing to visit AERO Friedrichshafen. 18 to 29 April: Sun 'n Fun Tour 2015, Lakeland, Florida, USA. 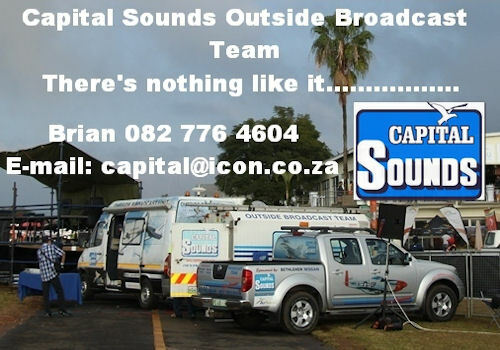 Contact Neil Bowden: e-mail: neil1@telkomsa.net . Neil Bowden will once again be organising a tour to the USA's second largest fly-in, the Sun 'n Fun Fly-in and International Expo. In addition to the airshow, we will be arranging an excursion to the Kennedy Space Centre. A great new feature here is the Space Shuttle Atlantis exhibition building housing the original Atlantis Shuttle. Also planned is a visit to the Kermit Weeks Fantasy of Flight Museum which is home to some very rare aircraft and while we are in the area there are planned visits to the theme parks - Disney and Universal. The price is from R14 750 per person plus airport tax (about R7 400). Mack Air Charters, Maun, Botswana: Urgently seek to fill the below commercial pilot positions. Applicants must be rated on the following aircraft with relevant flight experience: Two junior pilots with hours ranging between 300Hrs - 500Hrs C172 &/or C206; Two Intermediate pilots with hours ranging between 500Hrs -1000Hrs C172, C206, C210 &/or GA8; One Senior Pilot with hours ranging between 1000Hrs - 4000Hrs C172, C206, C210, GA8 &/or C208B. All applicants must have a minimum of a C172, C206 or GA8 rating. C208B rating an advantage. Dangerous goods course and Crew resource management an advantage. Commercial Pilot with minimum 300-500 hours licensed on at least two of the aircraft that we operate including C172, C206 and/or C208 Series. A clean safety record, English Proficiency, and flexibility to overnight in remote lodges as required also essential. Moremi Air Services requires Commercial Pilots with Current FAA/JAR/ICAO commercial pilot licences and Class 1 medical valid for a minimum of 10 months. The prospective applicant should have a minimum of 500 hours total time with a Cessna 206 or GA8 rating. Interviews will be held in Maun and the closing date for applications is 30 November 2014. 17 November 1910 - Ralph Johnstone, a pilot for the Wright Exhibition Team, becomes the first American pilot to die in a plane crash when his machine breaks apart in mid air in full view of about 5,000 spectators at Denver, Colorado. 18 November 1985 - The first Space Shuttle, Enterprise, is flown to Washington Dulles International Airport atop a Boeing 747 Shuttle Carrier Aircraft and transferred from the National Aeronautics and Space Administration to the Smithsonian Institution for eventual museum display. Although lacking engines and a heat shield and never having flown in space, it has been used for shuttle portability, gliding, vibration, and launch pad tests and on publicity tours. 18 November 1923 - The first aerial refueling-related fatality occurs during an air show at Kelly Field, Texas, when the fuel hose becomes entangled in the right wings of the refueler and the receiver aircraft. The Army Air Service pilot of the refueler, Lt. P. T. Wagner, is killed in the ensuing crash of DH-4B, 23-444. 19 November 1969 - Apollo 12 lands on the Moon, allowing Charles "Pete" Conrad and Alan L. Bean to become the third and fourth humans to walk on its surface. 19 November 1952 - A North American F-86D Sabre fighter sets a new world speed record of 698.505 mph. 19 November 1919 - The first municipal airport in the United States opens in Tucson, Arizona and is still in use today. 20 November 1917 - The Zeppelin LZ-104 "Das Afrika-Schiff" makes a 6,757 km journey through Africa in 96 hours (average speed 71 km/h). 20 November 1783 - In a flight lasting 25 min, de Rozier and d'Arlandes take the first untethered ride in a Montgolfi�re in Paris, the first human passengers carried in free flight by a hot-air balloon. 24 November 1924 - A KLM Fokker F.VII makes the first flight from the Netherlands to the Dutch East Indies, taking 127 hours 16 min. FIRST USA SLING TAILDRAGGER SOLD!!! We have some very exciting news to announce! After a wonderful trip to the Copperstate Fly-In, The Airplane Factory, Inc. has sold its first U.S. based Sling Taildragger (Sling TD). This tailwheel version of the Sling 2 is the latest model designed by Mike Blyth and The Airplane Factory team. The factory has received the order and has already begun the production process. This beauty should arrive in the U.S. in about 6 months and we can't wait to have her join the Sling family. It's been a great last few weeks for The Airplane Factory. In addition to the recent sale of the taildragger, two Ready-to-Fly Sling 4's will arrive in the U.S. by the start of 2015 and will be available to demo. Ready-to-Fly Sling LSA's will be arriving every 2 months, with a few orders already placed, and 4 more kit builders have joined the Sling builders brigade. Our kit builders are also making great progress on their airplanes. Jean and Jordan recently drove down to visit Robby, who's just about ready to mount his engine. Jean spent the day with Robby and was very impressed with the fine job he has done. Robby's Sling 2 is shaping out nicely and he should have her flying in the next few months. If you live in Southern California, you've probably noticed the Sling flying its tail off. Two flight schools in the Los Angeles area are operating the Sling and have been putting over 100 hours on it every month. Hope you all have an amazing week, and please stay tuned! We will be headed to the 2015 U.S. Sport Aviation Expo in Sebring, Florida and will have many more exciting announcements in the coming weeks. The world's latest generation commercial airliner, the A350-900, received Type Certification on the 12th November from the US Federal Aviation Administration (FAA) at FAA headquarters in Washington D.C. FAA Associate Administrator for Aviation Safety Peggy Gilligan and Airbus Group Inc. Chairman Allan McArtor were among the signing authorities at the official ceremony. The certified aircraft is powered by Rolls-Royce Trent XWB engines. Today's milestone follows the A350-900 Type Certification awarded by the European Aviation Safety Agency (EASA) on 30th September. The A350-900's respective FAA and EASA certification awards come after Airbus successfully finished a stringent program of certification trials which took the A350-900 airframe and systems well beyond their design limits to ensure all airworthiness criteria are fully met. The fleet of five test A350-900 aircraft completed the certification flight test campaign, on time, having accumulated more than 2,600 flight test hours to create and successfully achieve one of the aviation industry's most thorough and efficient test programs ever developed for a commercial airliner. 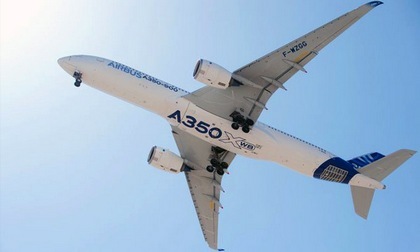 The A350 XWB is Airbus' all-new mid-size long range product line and the newest member of Airbus' leading widebody family. The A350 XWB stands out in its class thanks to its combination of passenger comfort, technological innovation and its unique industrial process. Built hand-in-hand with our customers, the A350 XWB sets new standards in terms of passenger experience, operational efficiency and cost-effectiveness. At the end of October 2014, the A350 XWB had won 750 orders from 39 customers worldwide. The Orion spacecraft has been transported to launch pad 37 and has been lifted about 200 ft. to mate with the Delta IV Heavy rocket. 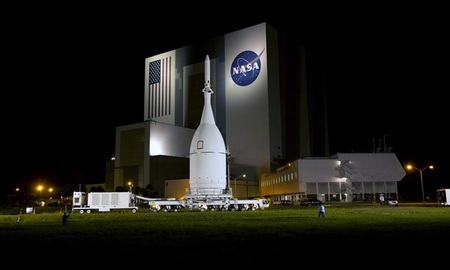 The Lockheed Martin built Orion spacecraft has completed its 22-mile, 6-hour journey from the Launch Abort System Facility at Kennedy Space Center, to launch pad 37 at Cape Canaveral Air Force Station, Florida. Orion is now another step closer to its first test flight on Dec. 4, 2014. "This spacecraft is going to push the boundaries of scientific discovery and human achievement," said Michael Hawes, Lockheed Martin Orion program manager. "One day, not too far in the future, an astronaut will leave the first footprints in the red dust of Mars, and we'll look back and say that journey started here." This morning, the 50,000 lb. spacecraft was lifted about 200 feet up and mated to the United Launch Alliance (ULA) Delta IV Heavy rocket, which Lockheed Martin contracted for the flight. Over the next few weeks, the rocket and spacecraft will be integrated and powered up, and engineers will test and verify interfaces between the two in preparation for Exploration Flight Test-1 (EFT-1). "It has been a tremendous team effort with all of our mission partners to get us to this point just one month prior to launch," said Jim England, ULA's EFT-1 program manager. "We are honored to play such a critical role in this important launch for NASA and are focused on providing mission success so that Orion can complete all of its mission objectives." During EFT-1, the uncrewed spacecraft will travel 3,600 miles beyond Earth-15 times further than the International Space Station. That same day, Orion will return to Earth at a speed of approximately 20,000 mph for a splashdown in the Pacific Ocean. EFT-1 will provide engineers with data about systems critical to crew safety, such as heat shield performance, separation events, avionics and software performance, attitude control and guidance, parachute deployment, and recovery operations to validate designs of the spacecraft before it begins carrying humans to new destinations in deep space. Headquartered in Bethesda, Maryland, Lockheed Martin is a global security and aerospace company that employs approximately 113,000 people worldwide and is principally engaged in the research, design, development, manufacture, integration and sustainment of advanced technology systems, products and services. The Corporation's net sales for 2013 were $45.4 billion. With more than a century of combined heritage, United Launch Alliance is the nation's most experienced and reliable launch service provider. ULA has successfully delivered nearly 90 satellites to orbit that provide critical capabilities for troops in the field, aid meteorologists in tracking severe weather, enable personal device-based GPS navigation and unlock the mysteries of our solar system. Cessna Aircraft Company, a subsidiary of Textron Aviation Inc., a Textron Inc. company, announced today the first deliveries of the Citation XLS+ business jets from the company's joint venture operations in Zhuhai. The joint venture (CESSNA-AVIC Aircraft (Zhuhai) Co., Ltd.) between Cessna and China Aviation Industry General Aircraft Company Ltd. (CAIGA) is delivering the first two Citation XLS+ aircraft to Guangzhou Zhongheng Group, Ltd. as part of the company's activities during Airshow China, Nov.11 - 16 in Zhuhai. Businesses around the world have continued to select the Citation XLS+ because of its unique blend of performance capabilities and operational efficiencies," said Scott Ernest, president and CEO, Textron Aviation. "We are honored to celebrate Guangzhou Zhongheng Group as our Citation XLS+ launch customer in China and commend the company for evaluating the options in the market and choosing this aircraft as the productivity tool that will help grow their business throughout the region." 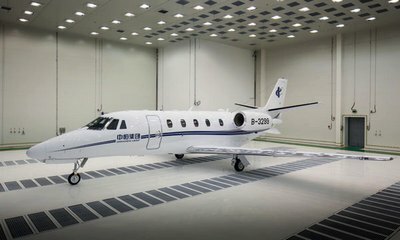 As a large enterprise covering various market segments including pharmaceuticals, hospitality, real estate, and food and beverage, Guangzhou Zhongheng Group selected the Citation XLS+ to provide greater access to locations where the company has facilities and customers. "Having the ability to quickly meet face-to-face with business partners and customers is key to our continued success and business growth," said Madam Xu Shuqing, chairman and president, Guangzhou Zhongheng Group. "By selecting the Citation XLS+, we know we are not only making a wise investment choice for our growing company, but that we are also backed by the unmatched breadth of support and expertise within Textron Aviation." The Citation XLS+ is the world's most sought-after business jet. Business owners consistently have chosen the Citation XLS+ more than any other aircraft in the light midsize category for its unparalleled combination of comfort, ease of operation, range of mission capabilities and favorable operating efficiencies. The aircraft provides customers access from Beijing to Hong Kong and Hong Kong to Shanghai, well within a one-day trip. Inside is the largest cabin in its class with nearly 19 feet (5.64 meters) of length, a dropped aisle that provides 68 inches (173 cm) of height the entire length of the cabin and seating for up to 12 passengers. It travels as fast as 441 knots (817 kilometers/hour) with a range of more than 2,000 nautical miles (3,700 kilometers) at long range cruise, departing from runways as short as 3,560 feet (1,085 meters). More than 6,600 Cessna Citations have been delivered to customers around the world since 1972. Citations are the largest fleet of business jets in the world and have surpassed 30 million flight hours. The U.S. Navy received its 200th submarine-hunting MH-60R "Romeo" helicopter from Lockheed Martin following a patch signing with Helicopter Maritime Strike Squadron Seven-Two (HSM-72). The cornerstone of the U.S. Navy's anti-surface and anti-submarine operations, MH-60R helicopters have flown more than 250,000 hours in operation with the Fleet, providing increased surveillance and situational awareness. "We are proud to continue supporting the U.S. Navy by delivering a multi-role aircraft with a game-changing sensor suite that shifts the advantage from the submarine to the helicopter," said Dan Spoor, vice president of Aviation and Unmanned Systems for Lockheed Martin's Mission Systems and Training business. 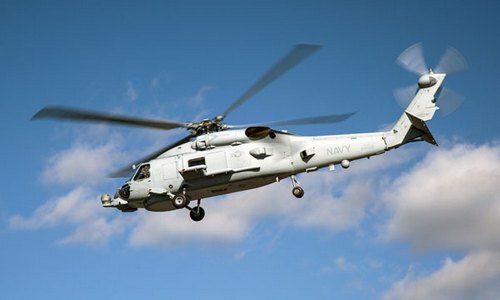 "As surface and submarine warfare becomes increasingly complex, the MH-60R's capabilities are unmatched in identifying, locating, tracking and prosecuting these threats." Manufactured by Sikorsky Aircraft Corp and provided with advanced mission systems and sensors by Lockheed Martin, the MH-60R employs a modular design, which refers to the ability to modify weapon systems to match specific mission requirements. The modularity gives this single platform the agility to provide greater surveillance and flexibility to the Fleet, tailored for the mission. Aboard the MH-60R, sensor data is integrated into actionable information for the three-member crew. The mission systems compile data from onboard and offboard sensors to create an integrated picture that enhances decision-making. Secondary missions include search and rescue, vertical replenishment, naval surface fire support, logistics support, personnel transport, medical evacuation, and very high frequency, ultra high frequency link communication relay. The U.S. Navy is projected to acquire 291 MH-60R helicopters. The Lockheed Martin-Sikorsky team has also delivered five of 24 aircraft to the Royal Australian Navy and began production for the Royal Danish Navy, which will acquire nine aircraft. PIPER AIRCRAFT DELIVERS 1ST CHINESE MATRIX To HANXING GENERAL AVIATION CO., LTD.
Piper Aircraft delivered its first M-Class Piper Matrix in China to Hanxing General Aviation Co., Ltd., one of Piper's dealers in China. The transaction was consummated prior to Airshow China 2014 so that Hanxing and Piper could display the airplane at the show being held here. This is Piper's first aircraft sold into China since the company recently received a Validation of Type Certificate issued by the Civil Aviation Administration of China (CAAC) for Piper's top-of-the-line M-Class single-engine aircraft. The Piper M-Class series consists of the unpressurized piston-powered Piper Matrix, the pressurized piston-powered Piper Mirage and the turboprop Piper Meridian. 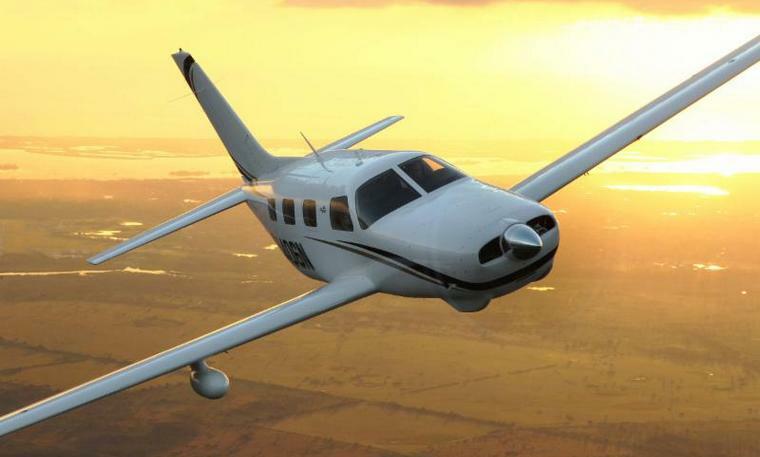 "Hanxing is very confident it will sell this Piper Matrix to a Chinese customer; the airplane meets the criteria related to performance and economics, as demanded by customers," said Piper President and CEO Simon Caldecott. "Piper and Hanxing are benefiting from considerable positive attention at Airshow China, as China continues to develop its General Aviation infrastructure and provide easier airway access." Piper Aircraft representatives in China for the Piper M-Class are Hanxing General Aviation Co., Ltd. and Piper Summit Aircraft China, Ltd. Hanxing General Aviation Co. in Zhuhai has exclusive sales rights for the Piper Matrix and Piper Summit in Beijing has exclusive sales rights for the Piper Meridian. China's Aviation Industry Corp (AVIC) publicly revealed its new stealth jet during the China Airshow held at Beijing. The Falcon Eagle it is manufactured by a unit of AVIC. The aircrafts existence has been the subject of rumour and speculation for a number years, with photographs appearing increasingly frequently on military websites in recent months. China has steadily increased its defence budget for years, with funding projected to rise more than 12 per cent to $132 billion in 2014. Defence analysts said China appears eager to sell the new fifth generation fighter abroad. AVIC has already developed in cooperation with Pakistan the FC- 31 which was also on display at the show. Sikorsky celebrated its 30th anniversary in China together with China civil aviation industry peers at Air Show China, which is taking place November 11-16, 2014, in Zhuhai, China. "We have been a long-term friend to the China civil aviation industry," said Mick Maurer, president, Sikorsky Aircraft Corp. "We delivered our first five S-76A helicopters to Chinese companies in 1984. Today, we have more than 100 Sikorsky civil helicopters supporting offshore oil, search and rescue, executive transport and other commercial business needs throughout China. We're excited to celebrate our three-decade friendship with the China civil aviation industry at Air Show China." In the past 30 years, Sikorsky has achieved a series of milestones during its collaboration with the China civil aviation industry. 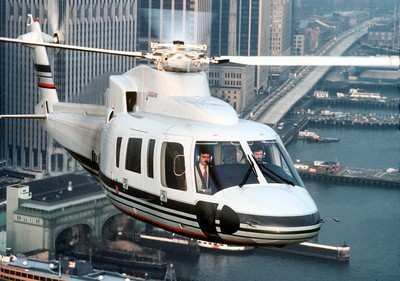 Then in 1996, the first delivery of an S-76C+ helicopter was made. Four years later, the Ministry of Transport received the first S-76 search-and- rescue helicopters. In 2003, Sikorsky formed a joint venture with Shanghai Little Eagle to provide civil helicopter sales and support as well as general aviation services. 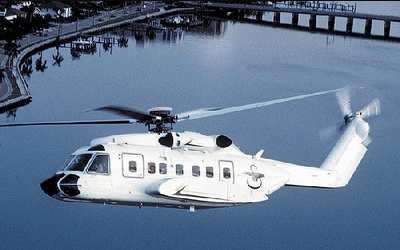 The S-92 and S-76C++ entered the Chinese market in 2005, and in 2008, the first S-76 for executive transport was delivered. In the same year, AVIC, through its subsidiaries Changhe Aircraft Industries Corporation and Shanghai Xinsheng Aviation Industry Investment and Development Company, joined Shanghai Sikorsky to support S-76 and S-92 helicopters under the new JV name of Shanghai Sikorsky Aircraft Corporation. More recently, in 2013 Sikorsky and China's CITIC Offshore Helicopter Company (COHC) announced an agreement to supply S-92 helicopters to support COHC offshore operations. Sikorsky became the only helicopter OEM to supply for all three major offshore oil service providers in China. In the same year, Sikorsky reached an agreement with Changhe Aircraft Industries Group Co., Ltd. that Changhe will produce S-76D commercial helicopter cabins for Sikorsky. This year, Sikorsky received a validation type certificate from the Civil Aviation Administration of China (CAAC) for the S-76D helicopter. In April, Sikorsky delivered the first S-76D helicopter to Yunnan Jingcheng Group for transportation of corporate and government VIPs. S-76D is the latest Sikorsky model and features Pratt & Whitney Canada's PW210S engines. "I'm pleased with the collaborations that we have developed with the China civil aviation industry over the past 30 years," continued Maurer. "We value China as an important market and it is a privilege for us to contribute to the development of this industry." To industrially accompany the A350 XWB ramp-up and other aircraft production rate increases, Airbus took the decision to launch the development and production of five new Belugas. The new Beluga will be based on the A330 with a large re-use of existing components and equipment. The distinctive looking lowered cockpit, the cargo bay structure and the rear-end and tail will be amongst the items which will be newly developed. The first of the five new Belugas will enter in service in mid-2019. The existing Beluga fleet will operate in parallel, and will be progressively retired through to 2025. The current Beluga fleet of five aircraft is based on the A300. The "Beluga", is Airbus' unique method for transporting large aircraft components- between company production sites in Europe. Airbus had already l launched "the Fly 10000" project aiming at doubling the current Beluga capacity by 2017. However the current capacity is limited and the new Beluga fleet will close this capacity gap. With its flexibility and short transport lead-times, oversize air transport is a cornerstone of Airbus' industrial operations.